SEATTLE--(BUSINESS WIRE)--Dec. 3, 2018-- (NASDAQ: AMZN) Drumroll, please! Amazon today announced the Best of Prime 2018, highlighting how Prime members around the world enjoyed their benefits throughout the last year. More new members worldwide already signed up for Prime in 2018 than ever before and, new this year, members in Australia can now experience Prime’s benefits – bringing the number of countries with Prime to 17. Prime members worldwide ordered more than two billion products with one-day delivery or faster in the last year, showcasing the breadth and value Prime members enjoy in delivery speeds. Top honors in the U.S. went to The Marvelous Mrs. Maisel (most awarded show on Prime Video), Tom Clancy’s Jack Ryanstarring John Krasinski and Homecoming starring Julia Roberts(most bingedshows on Prime Video), Justin Timberlake (most streamed artist on Prime Music), “Black Panther” (most enjoyed comic-to-movie adaptation on Prime Reading), Fire TV Stick with Alexa Voice Remote (best-selling product overall), organic apples (most popular Prime member deal at Whole Foods Market) and video game Fortnite (most popular in-game loot from Twitch Prime). 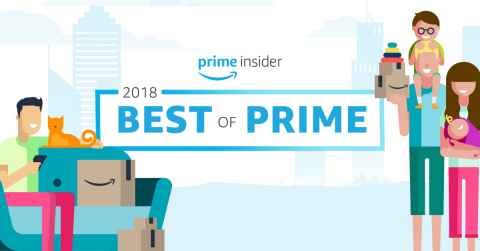 Amazon’s Best of Prime 2018 can be found on Prime Insider at amazon.com/bestofprime. Members have adopted the new savings benefit at Whole Foods Market at one of the fastest rates in the history of Prime. For the first time, members in the U.S. celebrated Prime Day with a week of savings at Whole Foods Market. Members saved millions while shopping at Whole Foods Market with Prime Day deals, and organic strawberries were the best-selling deal. Outside of Prime Day, the best-selling Prime member deal saw members scoop up enough organic apples to bake more than 350,000 apple pies. For the first time this year, Prime members experienced ultrafast delivery from Whole Foods Market stores through Prime Now – available in more than 60 cities across the U.S. with plans for continued expansion. In fact, Prime members in Austin, San Francisco and Boston took advantage of ultrafast delivery from Whole Foods Market more than any other city. Plus, Prime members in select cities experienced curbside pickup – enabling customers to order and retrieve their groceries from Whole Foods Market stores in as little as 30 minutes through Prime Now. This just in: The two most binged Prime Original series worldwide to date include Tom Clancy’s Jack Ryanstarring John Krasinski and Homecoming starring Julia Roberts. Members’ most popular purchase of the year in the U.S. was the Fire TV Stick with Alexa Voice Remote, followed by the Echo Dot – which was also one of the most gifted items during the week leading up to both Mother’s Day and Father’s Day, and the best-selling product on Amazon globally during the Black Friday and Cyber Monday holiday weekend. Prime members get even more from their membership with Amazon devices, including access to exclusive deals and easy access to music, video, photos, gaming, voice shopping, and more. The Best of Prime analyzed how Prime members worldwide enjoyed their Prime benefits between October 1, 2017 through September 30, 2018, unless otherwise noted. Information included in these results examines data at a collective level, without viewing personal information by specific Prime members.